After a long career in the service of the Senate, Roy Bullock came to the office of Clerk only a few years short of the then compulsory retiring age of sixty-five. As it transpired, he was compelled to retire even earlier due to ill health. Roy Edward Bullock was born on 12 December 1916 in Wagga Wagga, New South Wales, the son of Edward, a telegraphist, and Olive Ellen, née Hall. After attending high school in Wagga Wagga he won a Public Exhibition (a kind of scholarship, few of which were awarded) and attended the University of Sydney, graduating as a Bachelor of Arts with honours in 1938. After a year of teaching at Trinity Grammar School in Sydney, Bullock secured a position in the Department of the Treasury in 1939. While serving in various positions in that department, he completed a Bachelor of Commerce degree in 1944 from the University of Melbourne via Canberra University College, and was awarded the Robin Tillyard Memorial Medal. In 1946 he took up a position in the Department of the Senate as Clerk of the Papers and Accountant. Bullock’s progress up the ladder of Senate positions was relatively rapid for those days, and in 1954 he was Usher of the Black Rod, in which capacity he also served as secretary of Senate committees, including the Regulations and Ordinances Committee, the training ground of so many future Clerks. While performing that role he served as secretary on the Senate Select Committee on the Development of Canberra in 1954 and 1955, winning the praise of committee members and developing a strong interest in the planning of the city. He became Deputy Clerk in 1965, under the new departmental structure which had recently come into effect. During the relatively long tenure of James Odgers as Clerk of the Senate, Bullock became the chronicler of constitutional and procedural developments which occurred as a result of the newly invigorated and more active Senate and its committees. He wrote many articles explaining events in the Senate to the outside world, and these are now invaluable historical sources. In particular, he wrote regular series of articles for The Parliamentarian, a journal of Commonwealth parliaments, and The Table, a journal for clerks and other staff of those parliaments. Bullock was made an Officer of the Order of the British Empire in 1969. 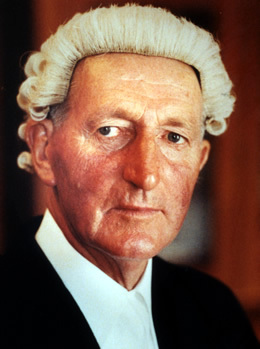 In 1971, at the request of the President of the Senate, Senator Sir Magnus Cormack, Bullock composed a paper on proposals to secure greater control by the Parliament over the appropriation of money for parliamentary services. It was not until 1980 that this came to fruition with the appointment of a Senate select committee to inquire into the subject. This resulted in the establishment of a separate appropriation bill and the appointment in March 1982 of the Senate Standing Committee on Appropriations and Staffing, which determines the Senate’s budget and advises the President on staffing matters. In his own quiet and courteous way he left his mark on this place, having guided many senators through the labyrinth of the Standing Orders during the 24 years he served as a table officer. His advice was always clear and concise, based as it was on a thorough understanding of and affection for the Senate. On 7 February 1948, at St Stephen’s Church of England, Willoughby, Sydney, he had married Phyllis Ann Crawford, a postal officer, of Delegate, New South Wales. They had two daughters. Bullock was of a very spare appearance but affable manner. His never-failing friendliness and optimism were noted by all who knew him. His colleagues remarked upon his single-minded pursuit of various hobbies he took up during his lifetime, particularly photography and gardening. He spent much of his retirement growing flowers on a rural property. He died at his Canberra home on 13 May 2006. At that time only Senator John Watson, the ‘father of the Senate’, was able to say that he had served with Roy Bullock, observing: ‘Although it is sometimes an overused and misapplied description, Roy Bullock was definitely a true gentleman of the old school’. Bullock, Roy Edward, Department of the Senate personal history file, A8804, NAA; CPP, S2/1955, p. 76; Roy Bullock, Transcript of oral history interview with Eric Sparke, 1984, TRC 1593, NLA. This series of articles, too numerous to list, began in 1967 and continued to 1979; G. S. Reid and Martyn Forrest, Australia’s Commonwealth Parliament 1901–1988: Ten Perspectives, MUP, Carlton, Vic., 1989, pp. 404–5. CPD, 2 Apr. 1980, p. 1422, 26 Nov. 1980, pp. 53–6, 13 June 2006, pp. 166–7. This biography was first published in The Biographical Dictionary of the Australian Senate, vol. 3, 1962-1983, University of New South Wales Press Ltd, Sydney, 2010, pp. 565-566.